Each of ACCM’s more than 100 fully air-conditioned guestrooms has contemporary travel essentials such as electronic keycard access, coffee and tea-making facilities, a cable TV, mini-bar, safe, and IDD/ NDD phone. Furthermore, accommodations are also complete with an executive work desk and a private toilet and bath. 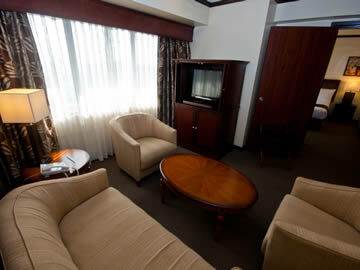 To keep on-the-go businessmen in touch with the world, all rooms at the conference center are fitted with Internet connectivity and a daily supply of local newspaper.